Discussions around the table-"on the needles"
Recently a discussion arose around the table at River Colors Studio. A customer came in looking for the right yarn for a new project, found it, happily purchased it and then sat down at the table and pulled out a different work in progress. She had been so excited about the yarn for the new project that I was surprised she wasn’t already beginning to cast it on. Oh, no, she said. She had to finish what she was currently working on before she started a new project. I admire that attitude and said so. It is, however, not at all how I knit, and I said that, too. Well, it would be okay to have two or three projects on the needles, so that you could alternate between them. Sometimes you have to rest your wrists or your eyes, and some projects are just not good for social knitting occasions. Everyone around the table agreed that a little variety was a good thing. Gretchen made a good point: And if it’s more than just knitting, well, around my chair I have crochet projects, plus my drop spindle and the yarn I’m currently plying. It’s all work in progress. There were some nods of recognition around the table. But the stuff that’s in a project bag which has been relegated to the chest or the closet—it’s on the needles, but it’s not exactly in progress at the moment. Or possibly for many moments in the past. Yet I may still believe it has a future, so I am not yet willing to frog it. There are a lot of projects like that in my craft area. I think of them as gratification in waiting. A hat that really just needs one more repeat of the lace pattern and then the crown decreases? That’s a weekend of my time that will result in a gift ready for some occasion. The sweater that’s in the middle of the boring stockinette part? I might be waiting for a bad cold or a sprained ankle, but eventually that project will be exactly what I want in my hands. So it stays on the needles, waiting for its moment. That I am more than okay with these projects lying in a state of unfinished rest, neither ready to re-purpose the yarn nor finish the garment, clearly marks me as a “process knitter.” I am captivated by the “how” of the stitch, the pattern, the construction—it’s a puzzle I want to solve. Very rarely do I knit something because I want the object. If I’m doing that, I have a deadline and those who have followed the progress of the pink chevron shawl have actually seen me work at one project steadily until it was done. Well, there might have been some breaks for a pair of socks and a square for my Noro blanket, both projects that pre-date the pink chevron shawl by months, if not years. 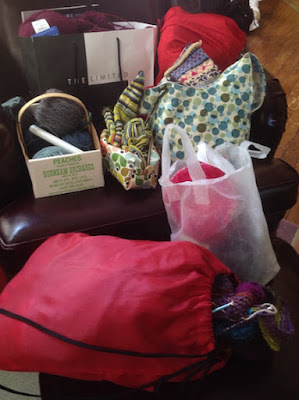 Pictured above are the projects I consider currently "on the needles" on my favorite chair (and ottoman). Clockwise from the Limited bag, I have Outlier (shawlish), The Vampyre (shawl), Kirsten's Mittens, Chevron Shawl, bag of Noro squares for the Paintbox blanket, Mo Nighean Donn (shawl) and in the middle, a pair of socks. The fact of the matter is that I am the master of my knitting. There are no Knitting Police, and since it’s a hobby that brings me a great deal of pleasure, I do it the way I am moved to do it. There’s no wrong way to enjoy knitting, except by turning it into an obligation.